Can Blogging affects web traffic? Blogging isn’t just writing posts. Blogging means to maintain or update a blog. You need to constantly monitor your blog’s content, images, videos etc. Here is the list of 10 handy iPhone apps which can make your blog more flexible. 1. BlogPress You can easily and quickly make blog in some minutes. Beside text you can add images, videos in your blog . It also supports some mainstream platforms such as Blogger, WordPress, TypePad, Drupal, Joomla and many more. You can also upload more than 1 photo in a single post. You can conveniently use HTML. 2. WordPress for iOS This new optimized WordPress makes blogging more easier. You can effortlessly moderate, edit or reply to comments, elegantly create or edit posts, add as many images as you like, add videos. You can also share your location. To use this application you must have either a WordPress.com blog or a self-hosted WordPress.org site. 3. Squarespace You can freely customize and manage your Squarespace site. You can effortlessly manage and edit your blog post, upload multiple images, save drafts, manage your contents, preview you site, and view your site’s statistics (including recent referrers, search queries, RSS subscribers, and more). You can also manage multiple accounts all at once by switching back and froth between them . 4. Photobucket Mobile This free app allows you to upload multiple photos and videos all at once. This app gives you new and easy to use interface to upload, download, share, move and copy your images. It supports pinch and zoom effects. You can also manage your image album in a convenient manner. 5. Adobe PhotoShop Express You can capture, edit and share photos from your mobile.You can Crop, Straighten, Rotate, and Flip your photos. You can also set different color effects to your photos. You can filter(including Sketch, Sharpen), add effects(Vibrant, Pop, Border, White Glow, etc) and borders(Rectangle, Rounded, Oval, Soft Edge and Film Emulsion). 6. CellSpin This blogging application allows you to capture text, photos, audio, and videos and upload them to any social networking sites like Facebook, Twitter, YouTube, Linkedin, CellSpin, Typepad and many more on just one click. You can also use it for some kind of secure posts. 7. Twitter We all know about Twitter. You can avail all the features of twitter on your iPhone. You can use this app for find & follow friends, Tweet, Retweet, Favorite, Direct Message privately with your followers, share photos, videos and web pages, real-time search, view maps, trends, and follow your interests. 8. Facebook This provides you an easy way to stay connected and share information with friends using you iPhone. You can chat, view others latest updates, check your friends’ latest photos, share your photos, share your latest information, videos and status updates, look up a phone number, or upload your own mobile photos to Facebook. You can even comment on your posts or your friend’s posts. , Customizing date range are the features of this app. 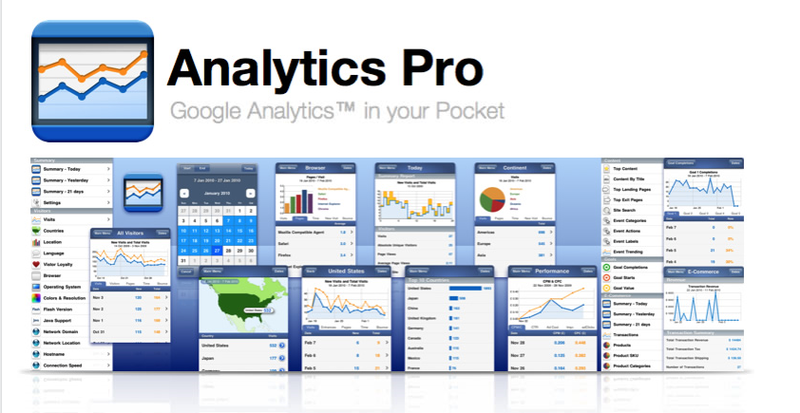 To use this app you must have or create a Google Analytics account. 10. Analytics Pro Intuitive Date Picker, grouping and sorting of Multiple Accounts, Portrait and Landscape Graphs & Maps, creating Multiple Graphs and data for metrics, Export Data to Text and PDF file are the features of this app. We can use intuitive date picker for setting the date range. These apps will definitely makes your blogging tasks much easier then before.